During my junior year, I took an OHG World Geography course taught by Teresa Gordon. 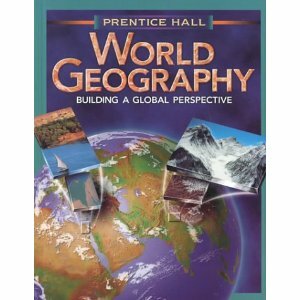 For the this class we used the Prentice Hall World Geography, Building a Global Perspective, textbook by Thomas J. Baerwald and Celeste Fraser. The course ran the whole year, and we met for class once a month. Each student would read a full unit between each class. Also, as part of our assignments, we all answered the review questions at the end of each chapter and brought them to class. In class we would review the main topics from the chapters and then open up a discussion about what we found to be the most interesting or surprising thing we had learned. At the end of class we would take a short quiz, which often tested our geographical location knowledge of the current continent or area we were studying. I learned a lot about general world geography by covering the eight units of the book: Physical and Human Geography, The United States and Canada, Latin America, Western Europe, Eastern Europe and Northern Eurasia, Southwest Asia and South Asia, Africa, and East Asia and the Pacific World. I learned more than just a place’s location. I learned its character, how people interact with the place; and how people, goods, and ideas flow through it. It was particularly interesting to learn the similarities and differences between different places around the world.